This is a favorite rose of mine and I wish I could remember the species. It has been in my garden for many years. I remember going to a local nursery with a friend and just could not leave without purchasing it. The color is such a soft, pretty pink and the scent light, fragrant and delectable! 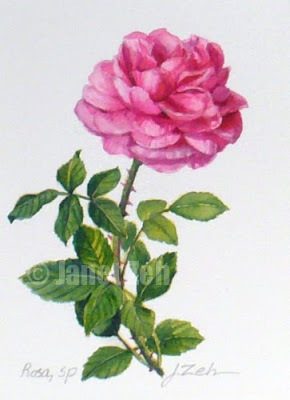 It was a joy to paint this lovely flower - even when it fades, the petals will still be so fragrant that I will use them in a potpourri. This original botanical painting is 7"x5" and is done with watercolor and a touch of colored pencil to create realistic depth. You can get this painting or print at Shop.ZehOriginalArt.com in the botanical section. Thanks for stopping by and have a beautiful day.